Spring is upon us, and my area has been especially subject to all the temperamental whims of its weather. One day may be in the 70s, with peepers calling in the night, and another is in the 40s and brings hard freezes as darkness falls. Because we have had a warm winter, and some very unseasonal March temperatures into the 80s, some trees have budded early and are being damaged by the weather’s mood swings. I tried covering some of my fully blooming bushes, but strong winds ripped the covers off in the night. There’s little I can do for my big fruit trees, so I leave them alone and hope for the best. Some plants that are not as subject to these tantrums are the spring ephemerals. Spring-beauties and trout lilies cover the floor of my chunk of woodland, with bloodroot and white and red trilliums making less common appearances. Virginia cowslip is found in a rare group, uncurling sprays of blue flowers. Skunk cabbage leaves are beginning to unfurl in the more muddy spots. May apples poke from beneath the leaf litter, barely spreading their umbrella-like form. 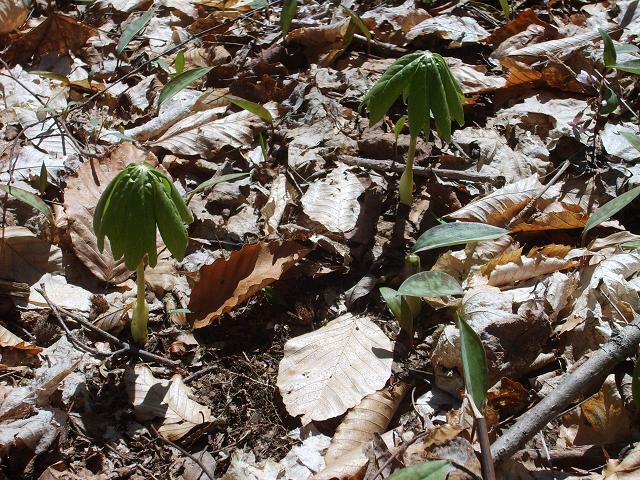 Young mayapple plants, surrounded by the speckled leaves of emerging trout lilies. To me, though, the ‘award’ for most obvious spring appearance belongs to the wild leek or ramp. Also known as spring onions, ramsons, wild garlic, or wood leeks, these plants can cover enormous chunks of ground in huge colonies of hundreds or thousands of individuals. They are found in much of the eastern half of the US and up into Canada, but are especially prevalent in the northeast. They provide patches of brilliant green in a time when the trees are still drab, a time when many of the ephemerals listed above are not showing their full glory (or are too small to be noticed by a casual passerby). Their bright color is a glimpse of what is soon to come – a harbinger of a forest awakening. These are all ramps. This is just an 'average' colony. They start like little knives, slicing through the beaten-down fallen leaves, sometimes literally piercing holes in them as they grow upward (later, you can find mature leeks still wearing these leaves like a skirt). Soon, their leaves unfurl their broad, waxy surfaces. Tapering down, the lower stem often has a reddish or burgundy tinge, but not always. The plants are anchored strongly by long, dangly roots. Manage to pull one out, and you’ll see that the bulb is covered by a membranous, slightly slimy ‘skin’. This can be slipped off in one piece, leaving a completely clean, bright white root for you to munch raw if you are so inclined. These pungent buggers are extremely popular fare in some areas, especially the Appalachians, where they are even ingrained in folklore. Ramp festivals are even held to celebrate this humble little onion. The entire plant can be eaten, leaves included. Now, even chefs at upscale restaurants are also recognizing them as a delicacy. The main species discussed here (Allium tricoccum) is legal to sell in many areas (although some less common species with much narrower leaves are protected and should not be touched) and some sellers fetch a pretty penny for them. This presents a problem for the leek, though. As is the issue with many things with growing popularity, overharvesting has the potential to take a serious toll. 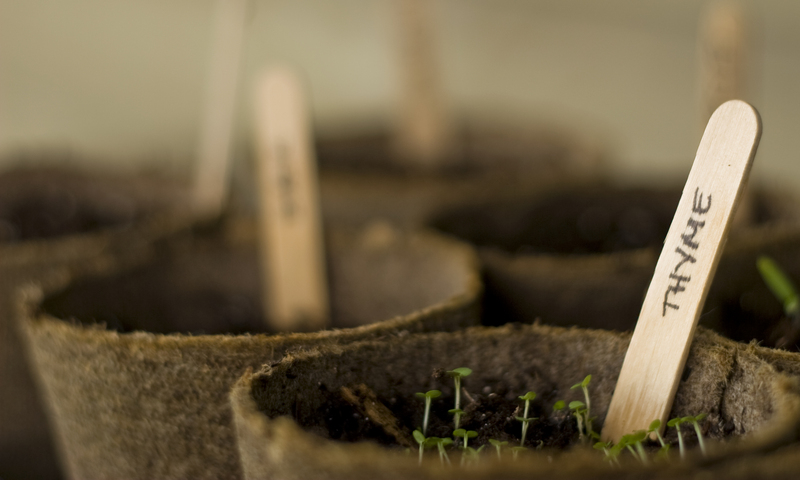 The abundance of an organism doesn’t matter when it’s exploited more than it can withstand. 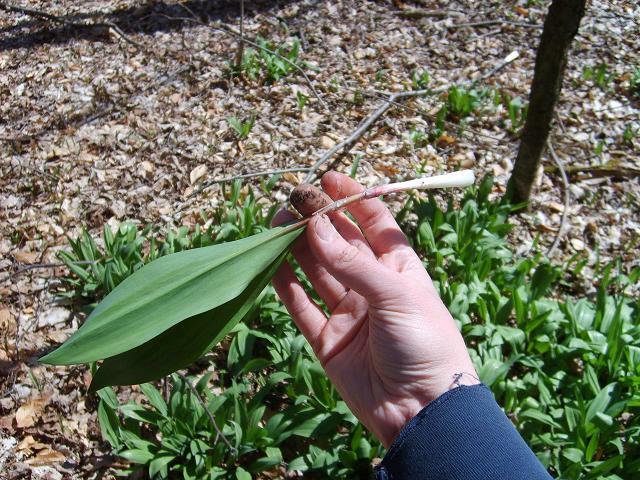 Sellers who grab their shovels and dig up clumps – or worse, whole colonies – of ramps limit the capacity of the plant to re-establish itself, helping to eradicate it in places where it may have covered acres in years before. 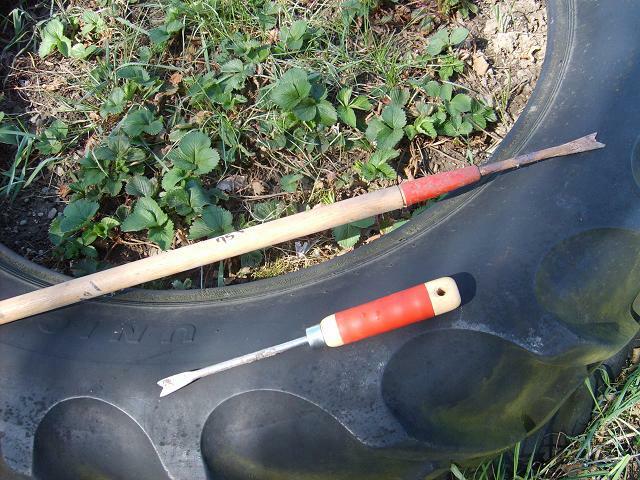 My preferred digging method - simple pronged root diggers. These are usually meant for dandelions, but work well (and you may be able to see that I got the larger one for 75 cents at a yard sale)! There’s nothing wrong with using the wild bounty, but it is best to use it responsibly so it can be there for the future, whether for us or for our children’s children. Ramps are still widespread for the most part. If you plan to harvest them, utilize populations on your own land, or get permission of the landowner before taking them. Public lands or parks may have regulations that prohibit digging or removing plants, so check them before proceeding in those areas. 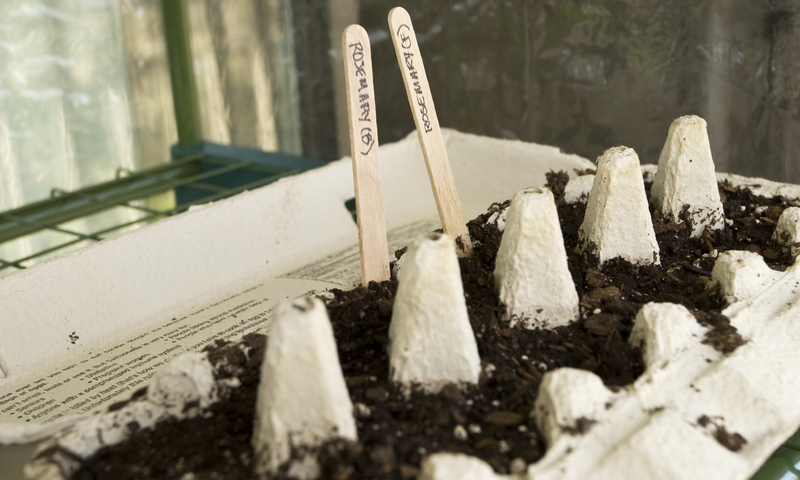 Dig only some individuals, and never remove entire clusters/colonies. If you use a digger like I do, it’s easy to take a plant here or there without doing much damage or disturbance to others nearby. You can still get a big bag full even if you only take a few from each group. Try to leave enough so they can replenish. This ensures that it can continue to reproduce and be harvested for years to come. 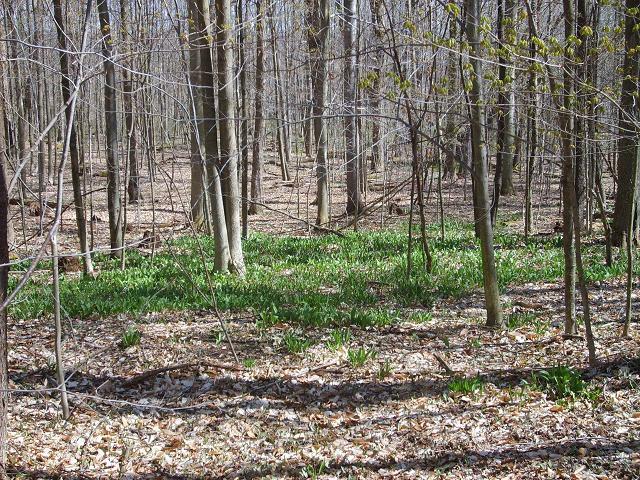 The wild ramp seems to prefer moist banks and hillsides in dappled-shade areas of woodland or along streams. They can be distinguished pretty easily by appearance, but for further proof, check that they smell strongly of garlic or onion when a piece of the leaf is broken – this ensures you do not confuse it with anything else. 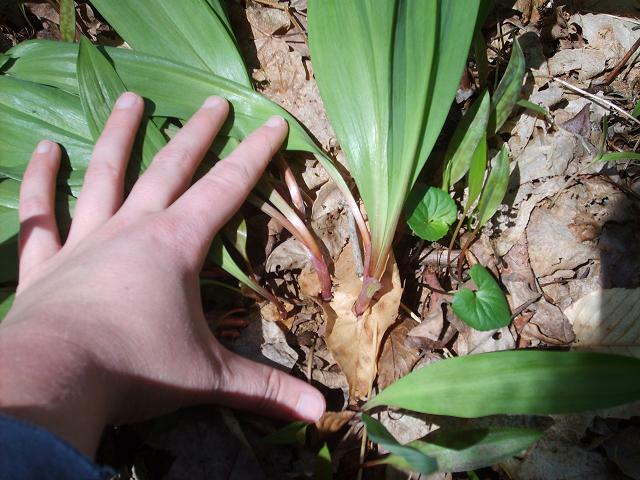 Early season ramps like the one seen above are the most tender and least ‘spicy’. As the season goes on, they get larger, but also get a stronger bite to them. Either way, they are versatile and, in my opinion, superior to both garlic and onions. 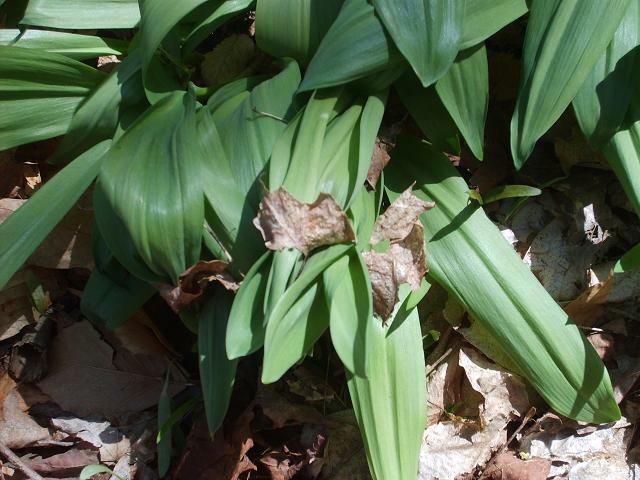 Ramps are actually present all year round, but become harder to find when the leaves die back, visible only by the brown flowering stalks. Once these get flattened down by the elements or buried by leaves, you would have to rely on your memory of where they were to find them at all. Ramps can be dried, pickled, or blanched and frozen (though freezing can make them lose some texture). They can also be stored in the refrigerator, unwashed, for a week or two. They can be used in place of onion or garlic in almost any recipe that calls for them as a component. I have put them in with steamed rice as a flavoring and thrown them into a stir fry. It can be put on pizza, fried with potatoes, or mixed in cream sauces. Our favorite is to toss them in with a creamy potato-leek soup recipe. Here is a comparable recipe for that, and here are a few other things you can do. A simple Google search will give you even more ideas, enough to keep you leeking it up for months to come if you turn out to be one of the people who loves them. Going for spring walks, especially across countryside, can bring you many experiences and discoveries. You may find a patch of flowers you’ve never seen before, or pick out notes in the varied melody of passing birds. You can see how surroundings have changed with the seasons, weathering processes and repeated frosts having affected the earth in their small, deliberate ways. The road bed may have given a little, causing the potholes that irritate motorists. Roofs need patching, battered by bitter winds. An uprooted tree may have created a dam, altering the flow of a stream. Much like the humans who repair and rebuild, though, the fish will return, driven to spawn as waters warm. This cycle of life hints at another, remnants of which can often be found along the same creek banks, or perhaps buried under chaffy leaves on the forest floor. 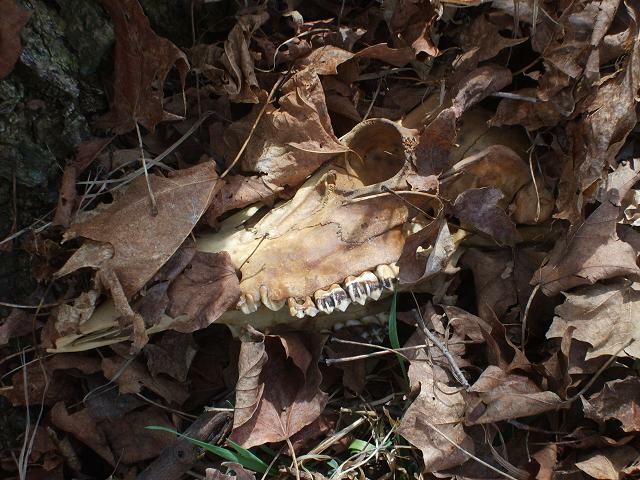 Instead of just a shed antler poking up from the ground, a skull or set of bones tells you that a creature breathes no more. This is a little macabre for some, but others might be drawn to it, fascinated. Whether the critter actually died in that very spot is often hard to tell. Carcasses are sometimes carried in the water and washed up on banks, dragged by scavengers, or occasionally even discarded along roads or in ditches by unethical “sportsmen”. Was it killed by a car? Natural causes? Again, often difficult to determine. You may shy away, and that’s alright. Such an interest is not for everyone. But for those who are curious, intrigued by the form of the bones and the stories they might hold, you can pick them up. 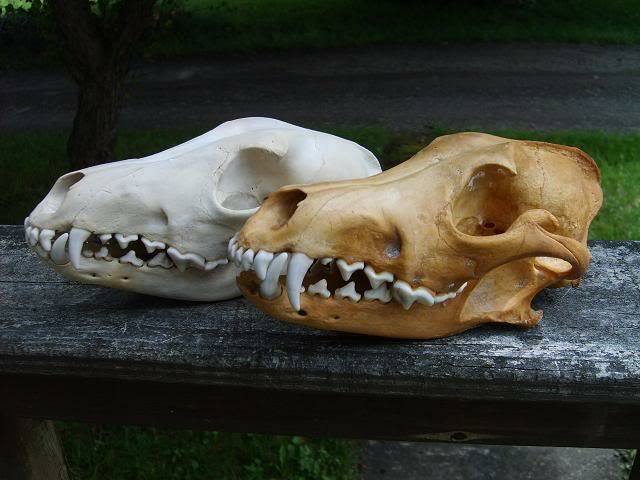 With a little time, you can create an interesting display/educational piece, crafting item, or product to sell (just check laws to make sure this is legal in your area, like I did, and don’t try to sell endangered/protected species). If a bone has been sitting a while, it’s often somewhat cleaned off for you – this takes the least work. Others may be … messy, to say the least. If it’s extremely unpleasant, I’ll leave it a while and come back for it. 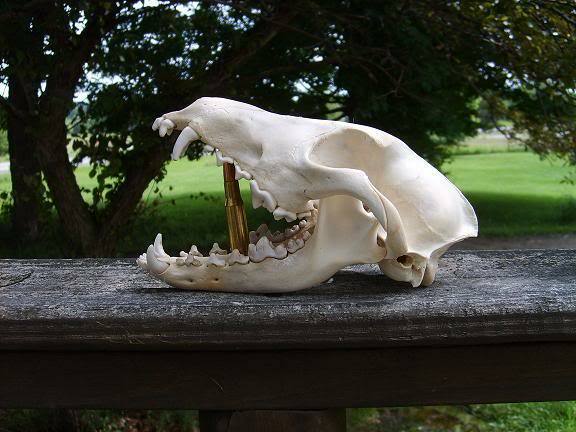 If a bone is very fresh, such as from an animal you hunted/trapped yourself, it can also be dealt with in the same ways, but you’ll have to prepare it first. Use a knife you’re comfortable with to remove as much outside flesh as you can, and if dealing with a fresh skull, then any device such as a wire or straightened coat hanger to break up and extract the brain. Skulls found outside often do not need that last bit. 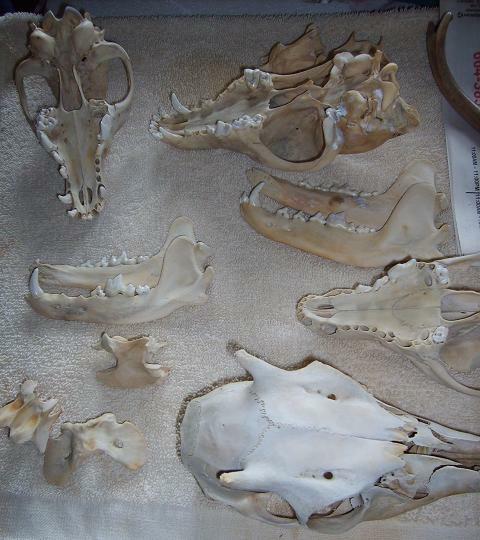 I do hunt, but because of the above, I favor the easier cleaning of found bones. Either way, there are several methods. – Unreliable, but super cheap and you don’t have to do anything! The method I am supporting here is cold water maceration. I don’t have beetles, or a desire to boil any bones on my stove or in my good canning pots, but I do have plenty of water, extra empty buckets, and many places I can put them. I find that a side corner of my deck is adequate. The odor isn’t as offensive as a nearby skunk might be, but you definitely won’t want it inside. It doesn’t seem to matter if the bucket is covered. Nothing has ever bothered mine. All you have to do is select your bone and bucket and fill the bucket with enough water to cover the bone. The process works best in warm weather, but at cool temperatures it just takes longer (I wouldn’t recommend trying to do it in winter, though, because the water may freeze and the process almost stop). You’ll need to keep the water level up, and to remove debris if it gets inside. It’s also best to periodically dump off most of the water and put fresh in, but this seems to be very forgiving. After a while of waiting, you should be able to see that bacteria have done their work. Change the water. If the bone looks fairly clean, rinse a few times and scrub lightly at any clinging particles. You can set them to dry and leave them just like that if you want, but there will be a slight odor and possibly a little discoloration. I ‘bleach’ (whiten) after cleaning. Hydrogen peroxide solution works well. This can be the standard kind found at the drugstore, or stronger stuff from beauty suppliers, diluted before use. Leave the bone in until it reaches the color you want or until it stops foaming, but don’t ignore it in there – it could eventually damage the bone. This process also deodorizes. ... and finally, like this! If I get a bone looking pretty good using maceration alone, I may skip peroxide entirely and simply dunk in a diluted solution of bleach and water. 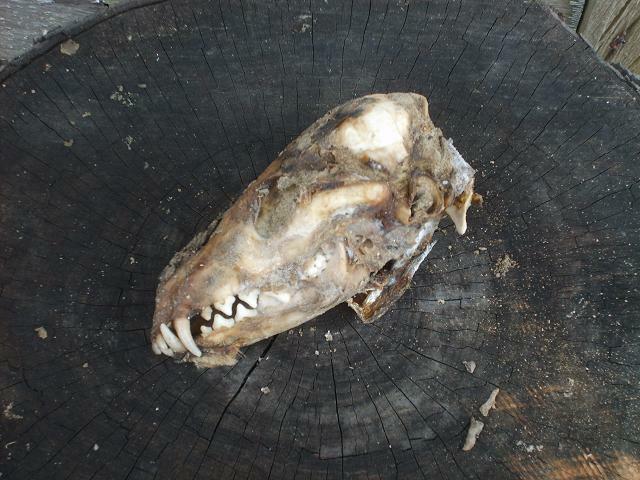 This takes care of odor and does some whitening, but a skull should not be left in bleach solution for hours. It damages bone and can cause flaking. After this is complete, rinse the bone well with plain water and set to dry. Once it’s dry, teeth or pieces that have fallen off can be glued with almost any clear-drying glue. You can then leave it as is, or you can clear-coat it. Clear-coating is not necessary, but if the bone is damaged by accidentally leaving it in the bleaching solution too long, it can help seal and protect the flaking surface. My chosen method for this purpose is just a mixture of plain white glue and water, which is also extremely inexpensive. The bone is then ready for its desired purpose. I’ve wanted to get chickens for a few years now, but life and its various hardships, large and small, kept getting in the way. Now that I’ve recovered from or settled into most of these, the idea came up again. As I’m in a better financial position than ever before, and I have a very supportive boyfriend who is happy to use power tools, I decided to go for it this time. Having had eggs from three different local flocks, I will say that there is often little comparison between a store-bought/battery egg and an egg raised on a small or local establishment. The latter generally offers a better, more varied diet with at least some outdoor access/access to forage. The yolks stand up more firmly and are much deeper golden/orange, and the texture of the overall egg is not as runny. The flavor is also superior, in my opinion, but beyond that, tests have shown that such eggs have a better nutritive value than ‘factory farmed’ eggs (although some larger egg producers, such as Eggland’s Best, are now feeding different diets that help with this. Just be wary, because ‘cage free’ and other such labels on egg cartons often mean nothing about the hens’ diet or whether they were actually allowed outside). I got my chicks from Mt. Healthy hatchery, which was recommended by an employee of Tractor Supply Company when I was pricing supplies. I would’ve gotten chicks locally, but I specifically wanted some Wyandottes, a breed that seems to be hard to find around here (and is on the ALBC-USA ‘Recovering’ list). The minimum order for Mt. Healthy is 15. Many sites have a minimum of 25, which was too many for me. Others will, using heating packs, ship as few as 3-6 chicks depending on where you live. However, reviews for some of these sites were sometimes poor and I didn’t trust that the chicks would survive. Having made up my mind, I put in for 5 Golden Laced Wyandottes, 5 Silver Laced Wyandottes, and 5 ‘Easter Eggers’, which are basically a mutt breed of chicken that lays colored eggs (pale blue or greenish, usually). They were born on the morning of March 14th. I got a call from the post office at 7am on the 15th, telling me the chicks had arrived. Upon inspection, all had survived and seemed lively. The shipping box was an adequate size for the number of chicks (not so big that they would be tossed around a lot, and not so small that they’d be smothered) and there was a bedding of straw. The chicks quickly ate/scratched at food, and began to drink on their own after gentle coaxing. After that, they plopped over and started to sleep, or sort of dozed off on their feet. So far, so good. – Plastic storage tote on wheels from Walmart (biggest size they had) – $20? but these things, if taken care of, will last for many batches of chicks, so it’s worth it. I was going to brood them in cardboard boxes, but that is dirtier/makes sanitation hard. Right now I am bedding them on pine shavings leftover from a past pet, so I didn’t have to spend any money on that. It’s lined with paper towels for the first few days to help them figure out what the real food is instead of pecking the bedding, and also to help their little legs get traction. As they get bigger, I may need to move them into something larger, like a kiddie pool (but I can probably get/borrow that for free). The only chick I can tell is definitely an Easter Egger. 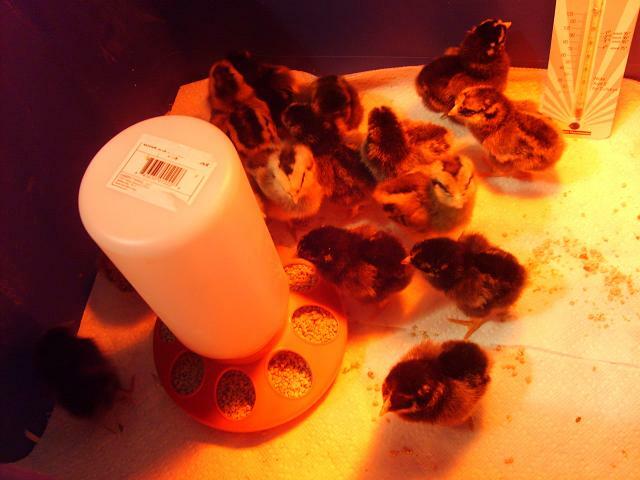 The thermometer wasn’t strictly necessary, because chicks will tell you when they’re cold – they clump together, peep more loudly, and huddle under the heat source. Similarly, when hot they will try to get away from the heat source, and might pant/gape their beaks. When comfortable, they spread out and walk around, eat calmly, nap, etc. 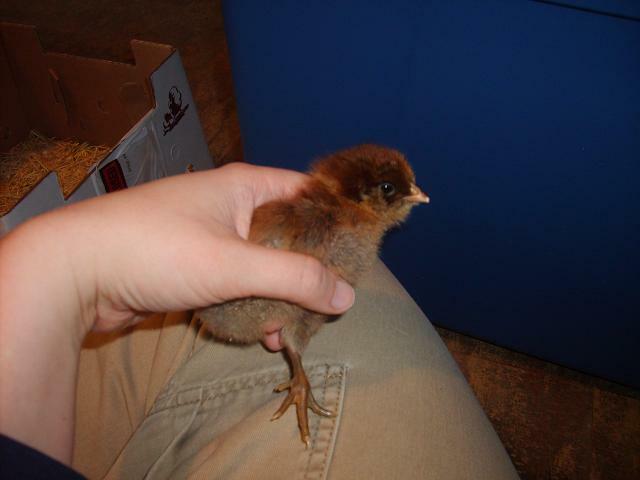 This is the chick I've been calling 'Lunk', as it seems to be bigger (or at least fluffier) than any of the others. Feed should be placed apart from the water and kept dry, because wet feed can grow harmful pathogens. I am feeding them Manna Pro chick starter crumbles. This feed is medicated with amprolium, an anti-parasitic that works to prevent coccidiosis, a disease that spreads and can sometimes kill baby chicks. 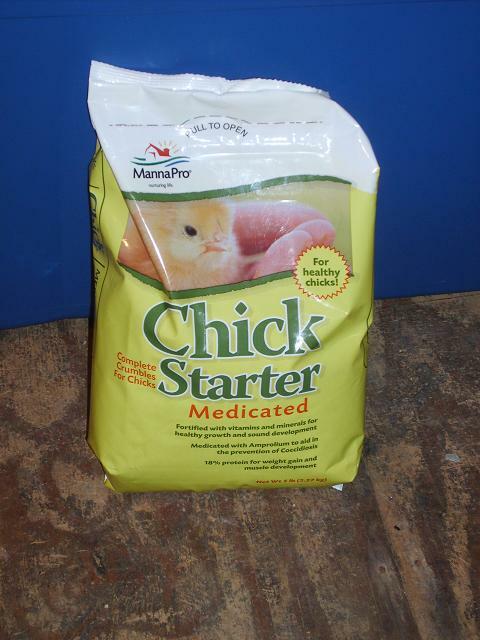 Those who want to avoid chemicals/drugs completely may not wish to use this type of feed, but since this is my first batch of chicks, I want to do everything I can to ensure their survival with minimal trouble. After they get older, they will be fed some standard poultry feed but also allowed access to grass/forage. As they grow, we will be building an outdoor coop for them, which I’ll be sure to update about. Costs will be relatively low and will be in things like screws, hinges, and the sheet of plywood for the floor. Because I live on this old farm, there are a lot of materials just lying around, including the cinderblocks we are using as a base. I am getting free chicken wire from the neighbor, because he had extra from his own chickens. From my dad’s job at a glass cutting/finishing shop, I will be getting discarded windows, 1×4″ lumber for siding, and 2×4″ and 2×6″ lumber for framing. Their glass comes to them in big cases made of the stuff, and those simply need to be ripped apart to be reused. I can also get all the egg cartons I’d ever need from my own workplace, but that’s a few months down the road. To anyone looking to raise chickens, I would strongly recommend looking around to sources like these for inexpensive or free materials. People have even made chicken coops using pallets as a base. If you can get stuff from a family member who has an ‘advantageous’ job like my father does, work with or live around someone who has chickens, etc. it’s worth asking them where they got theirs or if they have extra. It’s way cheaper to build your own than to buy a pre-made one, but this is especially true if you can find supplies you can repurpose. 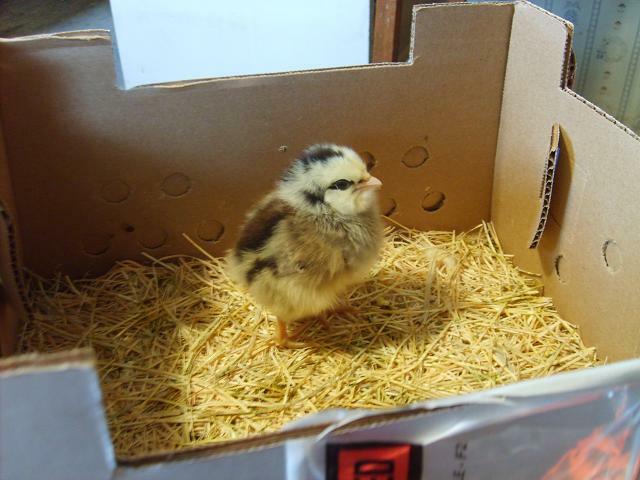 You can sometimes find cheap or free chicks/chickens themselves, as well as used or extra supplies, on Craigslist or your local Freecycle group (at least if you live in an area like mine). Some towns also have ‘spring cleanups’ where a variety of items are put to the curb, and occasionally you can find materials from peoples’ last remodeling job mixed in with that stuff as well. 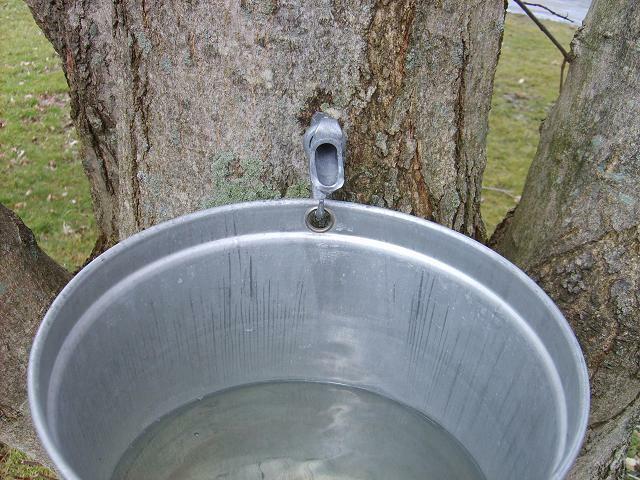 Tapping maple trees is easy and the rewards are sweet. Much of the process consists of a waiting game. Even for those who know and love the taste of maple products, nothing quite compares to the flavor of fresh, warm, homemade syrup. 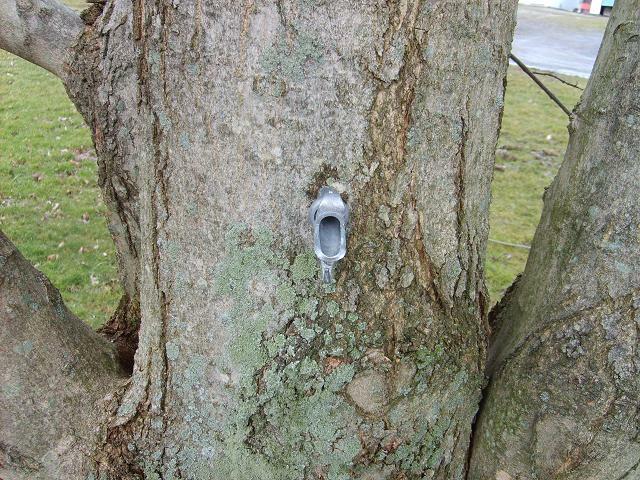 I first got sap from my trees last year, but I only used plastic pop bottles on tiny holes I made with a nail. This did not yield much sap, although the taste of the syrup produced was phenomenal. It made me seek more, and I vowed to buy some real equipment and try my hand at making gallons of it. I had long been a customer of Big Tree Maple, and I probably will still get the occasional item from them, but let’s just say that this season has shown me that I have no need to purchase syrup from anyone else ever again. I purchased a set of a dozen used, ~2 gallon aluminum buckets, new aluminum spiles (spouts), and flat metal lids. I wanted the aluminum buckets because they had a good combination of durability and light weight, and the price was very right – $4 apiece, as compared to brand new steel buckets at $20 apiece. Nothing was wrong with them, except that a few had minor dents that do not affect their functionality. To avoid more dents, I have taken them down when the wind gets above 40+ miles per hour (if they’re empty – full buckets are heavy, and stay on the trees extremely well). 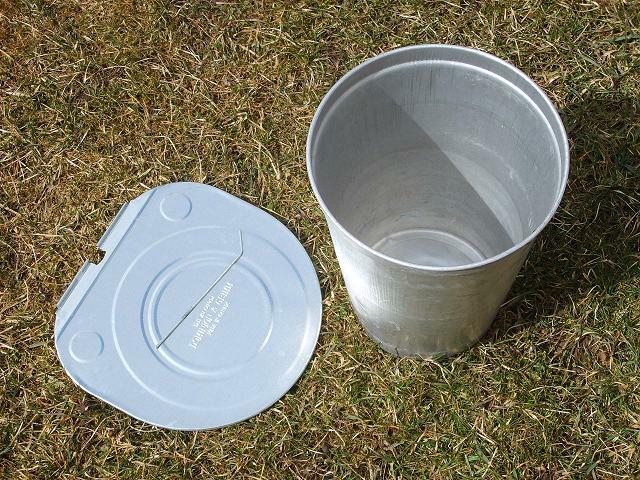 The only things I have to store my sap in are a set of large camp water jugs, which I carry to the trees and fill using a long funnel. You can use whatever containers you want, as long they’re food safe and clean. I sometimes get a little overflow of my sap buckets if I’m not home to watch them on a really strong flow day, but for someone like me, that’s not a concern, because it’s all I can do to keep up with it anyway. Sometimes I’ll even sip from the buckets before I mix them in the jugs, and if a tree doesn’t taste sweet that day or the sap seems mixed with rainwater, I’ll dump it out and only use the best sap. Many of the Acer species can be used for sugaring. Sugar maple is one of the best, because it’s sugar content is high and it buds later than others. However, red maple, Norway maple, black maple, silver maple, and box elder are all examples of other Acer species that will work. I only have 7 trees tapped – 3 have 1 tap/bucket, 2 have 2, and 1 has 3. One with a single tap is a silver maple, and all the rest are sugars. By far the best producing trees, both in volume of sap and sugar content of sap, are the largest three sugar maples. This makes sense, because maples with less competition and larger crowns are able to produce more sugar. On a good day, I can get over 20 gallons of sap. 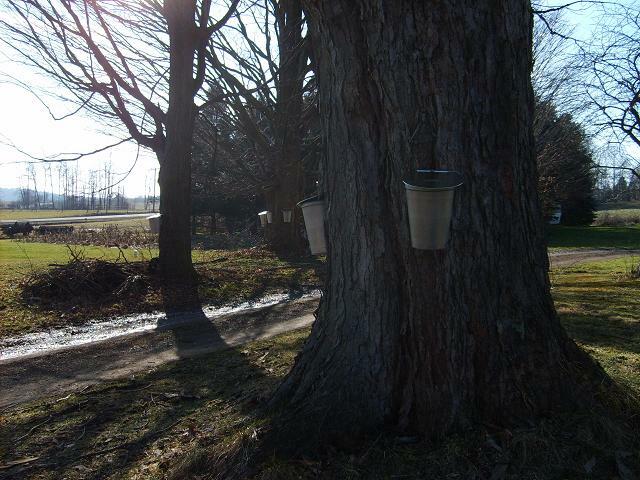 My trees are also more sugary than the ‘average’ maple in the 40:1 figure given for sap:syrup – my ratio has varied anywhere from the high 20s to low 30s:1. I boil on my kitchen stove only, so I can only make a couple of pints in a day, as my evaporation rates are far less than with a dedicated evaporator. For the quickest evaporation, it’s important to use flat pans with as large of a surface area as possible. I also keep the screens and doors open when I do this – if you don’t, the house steams up in a hurry, to the point of damaging humidity-sensitive things if you have any. This is another main reason an outdoor evaporator or a setup in a sugarhouse is better, but I don’t have the money for that right now. I started at the very beginning of February, and have since produced several gallons of syrup. The season began early this year. Sap flows when days are above freezing and nights are below. The syrup starts out light in color and flavor, and darkens/deepens as the season goes on. However, this early season might also come to a somewhat early end, because the warm temperatures will signal the trees to bud, and sap that flows during budding is not suitable for use due to off flavors. I take out bugs/detritus before and after boiling with a simple metal strainer – the kind made for tiny pasta. – Select your maple tree(s). A tree of a diameter greater than 10 inches or so can have 1 tap. A tree 18-24 inches can have 2, and a tree even bigger than that can have 3. You should not put more than 3 on a tree, or put any at all on a smaller tree. If you’re only doing a few/just starting out, it helps if the trees are near your house or somewhere you can get to them easily. You can use maple trees in the city, too! Just get permission if they’re not on your land. – Get your supplies together. You’ll need something to drill with, a hammer, something to catch the sap, and something to hang that sap-collector on. 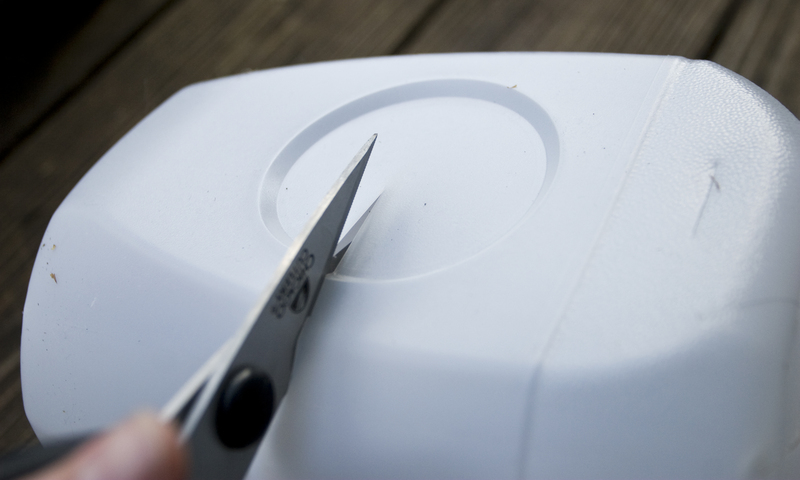 If the sap-collector is open at the top, it’s also best to have some type of lid, to prevent debris from getting inside (there will still be little gnats, especially in warm weather.) You don’t have to buy nice buckets. 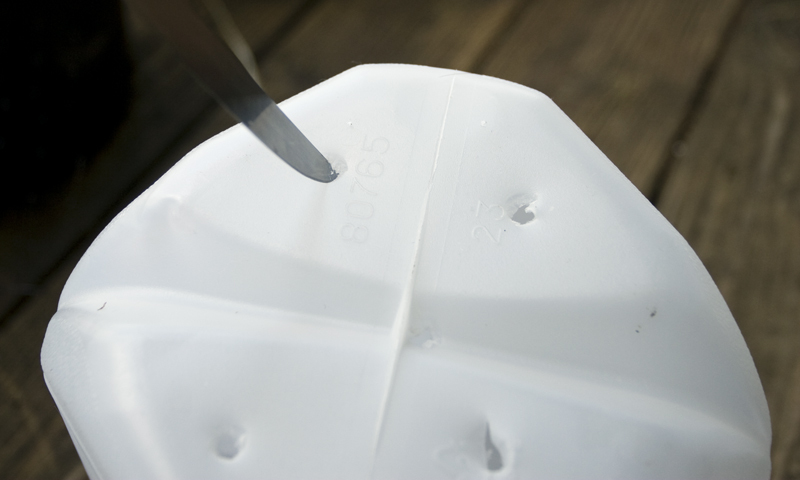 You can use simple things like milk jugs with the side cut open, and any type of improvised spile. Just don’t use anything that might be toxic to you or the tree. – Drill into the tree at a slight upward angle. You don’t need a gigantic hole. Just make one appropriate for your spiles. 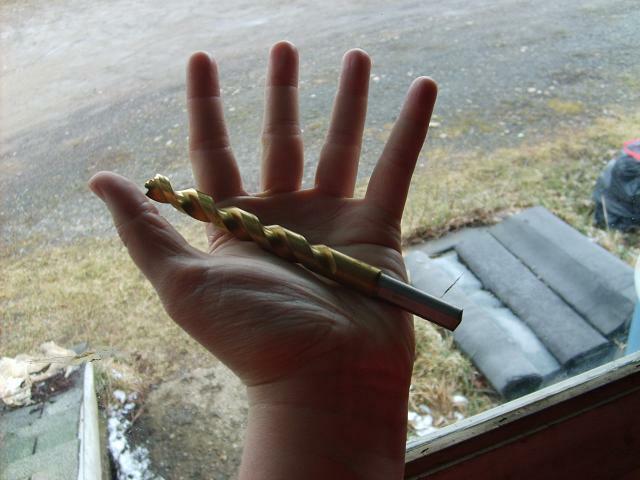 My spiles use a 7/16″ drill bit, and I just use a cheap Ryobi cordless drill. You could use a hand drill/brace too. It’s best not to drill on the most north facing side, because sap flows better on the other sides from sun exposure. Try to hold the drill steady, so you don’t make the hole irregularly shaped. Don’t drill too deep, either – it only needs to be 1-2″ deep at most, and the shallower you can get it while still being effective, the less of a wound it will leave. Also, don’t use any visibly wounded area or any area very close to any unhealed old tap sites. 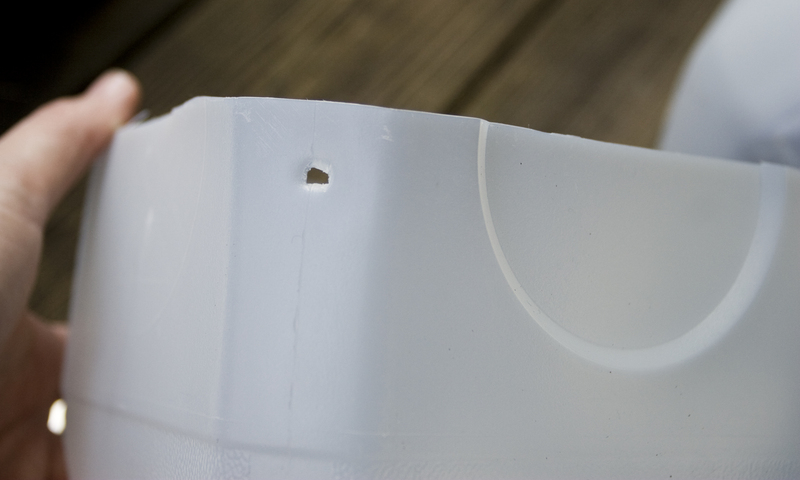 – Put your spile/spout into the hole you just drilled. To make sure it will stay in place, give it a few taps with a hammer. Don’t hit it really hard, as you can split the tree slightly, causing sap leakage around the spile. It doesn’t need to be in all the way, just enough to be snug in the hole. Hang your container. If the sap is flowing, you should see droplets already. – Put the lid on and wait. That’s all. Sap will fill the container, and you’ll have to come by and empty it. You can boil it by whatever means you wish – some have even used turkey fryers. Just consider your fuel costs, and remember what I said about the humidity if you do it in the house! Ventilate, ventilate, ventilate. After a while, you’ll notice that the bubbles start looking different. They also begin sticking together as they rise. They start out larger, but turn small and more foamy looking as it gets very close to becoming syrup. The syrup is done when it reaches 7.1 degrees above the boiling point of water, which varies with your location and can be measured with a candy thermometer beforehand. You can also tell when the syrup is done using a hydrometer. Some people filter the syrup through wool, felt, or cheesecloth to remove the sugar sand in the bottom of the pan. This ‘sand’ is only tiny crystals of the natural minerals of the syrup, and is not harmful, but it’s your choice if you’d like to remove it to create a clearer product. 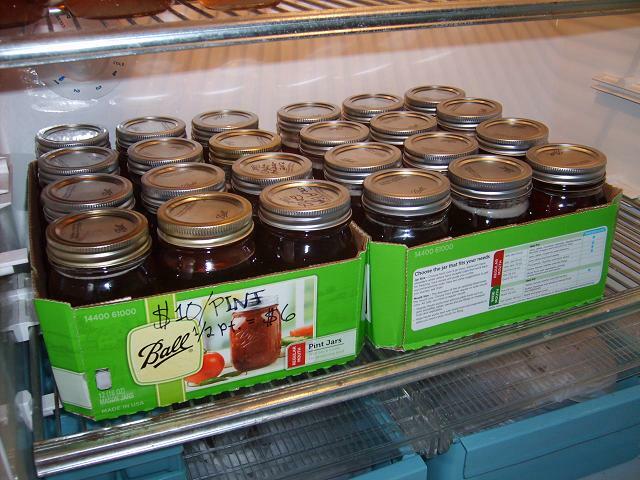 The syrup can be put immediately into sterilized jars, and will keep on the shelf for a long time in a sealed condition. It should be refrigerated after opening. You could also simply store it in any old container in the fridge, but it won’t keep as well. Very extended storage will affect the quality, causing darkening and some flavor loss. You’ll soon find that even with a few trees tapped, it’s easy to make a good quantity of syrup. It’s not difficult to sell, as many people love it, although you may want to check the regulations in your area/state for legality or other requirements. I’ve had people asking me for syrup or for prices before I even suggested I was thinking of selling. Set your prices based on other producers in the area and on your fuel/jar costs. Even if you don’t sell it, it also makes a great gift, although I wouldn’t blame you if you wanted to hoard it all. All you need to do at the end of every season is take the buckets down and pull out your spiles, and then give everything a good cleaning/scrubbing before storage so bacteria don’t grow on the leftover sugar. Buckets like mine, which nest together nicely, are best stored fully dry or on their sides, else they have a tendency to stick together a little. Then, when the next season comes, rinse things off and it’s all ready to go again. 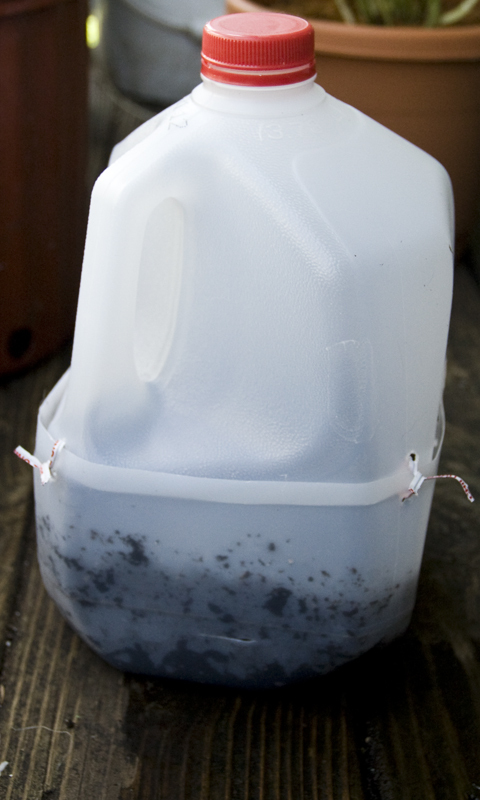 If you used milk cartons, pop bottles, or other disposables, you can skip this altogether and just start anew if you wish. You don’t need to plug the tap holes with anything, and doing so might even impede healing. The trees will heal themselves in a few years, or sometimes in only one if especially vigorous.